Moon Neo Ace review | What Hi-Fi? If you’re going to have “Neo” and “Ace” in your product name, you’d better be aiming high. Moon has certainly aimed for the stars – all five of them – with its all-in-one system. The Ace stands for “A Complete Experience”, and that’s exactly what Moon is offering for this £2800 one-box system. So what do you get with the Moon Neo Ace? Everything. Everything you need from a modern stereo hi-fi system, packed into one box. It’s an integrated amplifier with a high-resolution DAC and streamer. It has Bluetooth, wi-fi and internet radio. And it has a phono stage. All you need to do is add your favourite pair of speakers and voila! – you can start playing music from virtually any source. Inside, there’s a class A/B amplifier that outputs 50W per channel (into 8 ohms). Then there’s a hi-res DAC that supports everything from Spotify streams and MP3s all the way to 32-bit/384kHz and DSD256 files. We don’t know anyone with hi-res files that high, but rest assured the Moon will play all your 24-bit WAV, FLAC and AIFF tracks. The streaming section is where the Moon Neo Ace is at its most interesting and versatile. You can stream songs from your laptop or NAS, as long as they’re all connected to the same network. You get access to vTuner’s internet radio stations, and there’s also native Tidal support for streaming CD-quality music. With aptX Bluetooth, you can ping songs from your smartphone or tablet. You’ll have to pair your device through the Moon’s menu, but it connects swiftly and doesn’t falter. Connecting the Moon to your home network can be done via wi-fi, or for a more stable connection, the ethernet port. It connects instantly, too, and we didn’t experience any dropouts throughout testing – which is excellent news if you’ll be streaming a lot. In terms of physical connections, there’s a good spread of analogue and digital inputs at the back of the unit. 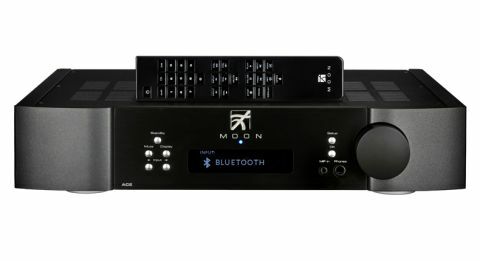 There are two pairs of RCA inputs (and one output), two inputs apiece for optical and coaxial, and a USB type-B for connecting your laptop to the Moon. Vinyl hasn’t been forgotten: a built-in moving-magnet phono stage means you can plug your turntable directly into the Ace. At the front, there’s a 3.5mm input to plug in music players, and a 6.3mm headphone port. One of the most crucial things for a successful hi-fi system is about how easy it is to live with. For a networked product like the Neo Ace that aims to play and stream everything, it becomes all the more important that simple operations don’t frustrate you before you even have the chance to enjoy listening. And the Moon gets that absolutely right. Everything just works. Connecting to the internet is done instantly. Changing volume using the remote or unit’s dial is smooth and instinctive. The MiND Controller app works like a dream. MiND stands for Moon Intelligent Network Device, and it’s the control brain of Moon’s streaming module. The included remote control is nicely built and works intuitively with the unit, but it doesn’t get you very far when you want access to all the songs in your vast, networked library. That’s where Moon’s MiND Controller app comes in. With it, you can select songs from every source – across the analogue inputs, your NAS library, your smartphone, Tidal, and internet radio. It’s fast and plays songs without delay. The app doesn’t try to be too clever. The interface is simple but neat, with menus and albums organised in a logical way. Album artwork pops up as you smoothly scroll through the list. We didn’t encounter any hiccups or lags even after a full week’s use. That’s impressive for any app. MORE: MQA Audio: What is it? How can you play it? The Ace design is similarly unfussy: smart, elegant, and sturdily built. The aluminium chassis and brushed front are reassuringly solid and built to a high standard. The curved edges make it look a tad more interesting than your standard rectangular box, while the neat fascia keeps things uncluttered with only a handful of buttons, a responsive volume dial and a prominent OLED display. The black and blue OLED display is crisp and easy to read despite the packed information. Even from an angle, you’ll be able to read the song/artist name, volume level, time lapsed and the file type. The buttons on the front panel let you delve into the Ace’s menus, from where you can connect to wi-fi, turn off the display, check for firmware updates and more. Other buttons let you select the input, dim the display and mute the sound. It’s easy to get to grips with in no time. There are some high-end products that take days to run in and perform at their full potential. Though it gets even better with time, the Moon is ready to listen to after a weekend of running in - but you won’t have to wait long to fully enjoy its performance. You’ll want to spend every waking moment with the Moon Neo Ace – it’s an inviting performance that makes you want to listen to every single song in your library all over again. We start by streaming from our NAS drive, and five hours later, we’ve pretty much gone through all our favourite albums. There are layers of detail uncovered by the Ace. You can easily place every instrument in the wide, open soundstage. Play Alice in Chain’s MTV Unplugged album on vinyl, and it’s obvious that they’re performing to a live audience. Conversely, Nick Cave’s vocals on (Are You) the One That I’ve Been Waiting For? sound intimate in its studio recording. It may feel like an easy-going, smooth presentation, but the Ace also handles dynamic shifts with great control and subtlety. The slow, melancholy build up of the piano and strings in Olufar Arnalds’ Raein is communicated beautifully, with the piano notes sounding solid and the music unfolding delicately to tell its story. The top end soars high with sweetness and sparkle in the dreamy-folk-indie-pop songs from Of Monsters and Men, never sounding too bright or coarse. The more aggressive notes – such as the fierce drums, deep basslines and intense guitar solos in Rage Against the Machine’s songs – are handled with punch and a decent amount of heft. Some might want a touch more attack and authority to the Moon’s presentation. The stop and start of notes could admittedly be that bit more definite. Nick Cave’s voice has a bit more grit and gravitas when we use our reference (and more expensive) Naim streamer as the source. But the Ace remains a pleasant and captivating listen regardless of those niggles. What makes the Moon special is just how smooth and engaging it sounds regardless of file type or recording quality. It’s happy to play any song you throw at it; it’ll play a hi-res Fleetwood Mac song with as much enthusiasm and rhythmic precision as a Spotify stream of Nirvana’s Smells Like Teen Spirit. It doesn’t discriminate. Of course, that means the Moon isn’t as transparent in showing every flaw in a recording. But it doesn’t trade any of its alacrity, detail definition or fluid dynamics to attain that wonderfully balanced but exciting sound. It’s quite a tricky balance to get right for any product, but the fact that Moon has been able to employ that sonic character across all of its inputs – wired and streaming – means that Moon intends every input to be used. And we can imagine doing so. The streamer section, the phono stage and the USB inputs all have similar tonal characteristics. The biggest surprise was vTuner internet radio. It’s usually on the lowest rung of the ladder when it comes to sound quality, but when a high-end hi-fi product can make old Savage Garden and Cardigans tunes sound so good over the radio, you know you’re in for a treat. It’s fair to say we’re rather taken with the Moon Neo Ace. It’s a wonderfully tuned system that puts music enjoyment at the top of its priorities, regardless of what’s being played. We love how easy it is to get along with – controls and network features are seamless in use and it’s a product we’d happily live with in our home. There are very few systems that combine all the separate hi-fi components so effortlessly into one box. If you’re looking for a new hi-fi system but can’t bear the thought of filling your home with multiple boxes, the Moon Neo Ace is the one for you.